right) enjoy an evening out for dinner at The Ultimate Jerk, a local restaurant. Our last full day in Jamaica! It was disappointing to wake up to rain at seven this morning, but by the time we all headed to breakfast at eight it had cleared up and was another beautiful morning. For breakfast we had a choice of scrambled eggs, bacon, toast and an assortment of fresh fruit. As soon as we were done eating, I headed to the room with Ashley and Rachel to finish up our presentation on coral disease. The weather was perfect. It sucked being cooped up inside on our laptops working on our projects. I guess that’s what we get for waiting until the last minute. After countless hours in the water, 400 coral specimens, over 3500 square meters of water and a lot of frustration we had results. 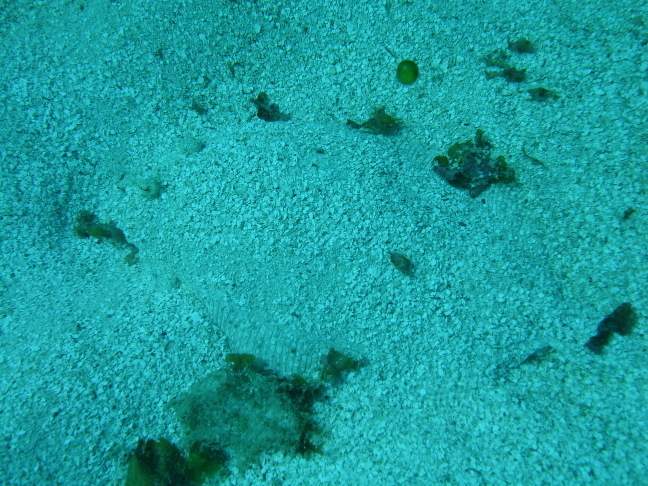 We concluded that about 37% of the coral in Discovery Bay is diseased. Not as high as I thought, but it’s still a depressing number. We took a break for lunch, which like everything else here was delicious. I’m not exactly sure what it was. I think it was jerk chicken wrapped in kind of a pie crust. Whatever it was it was awesome. Rachel was happy to see her favorite item on the menu. I took an extended lunch and laid out by the dock with my book, "A Salty Piece of Land" by Jimmy Buffett, to catch the last bit of sun. We started presentations at 4pm. I would be lying if I said it wasn’t long, but it was still fun to see everyone’s results that they have been working so hard for. We took longer than expected so we had to stop for dinner. Our last dinner here was excellent; BBQ chicken and ribs, rice, and the potato salad that every one of us loves. I’m definitely going to miss the food here. After dinner we voted on ideas for a class tee shirt. We decided on a black shirt with the outline of Jamaica filled in with the colors of the dive flag on the back, and everyone’s food name + first name below the image. As soon as we were agreed, which did not come easily, we picked up again on presentations and finished the last few. It feels great to be done! We celebrated afterwards by having one last bonfire on the jetty. We stayed out there for hours, despite the patchy rain and fire ants, and even had a guest appearance by Professor Warren. The clouds looked awesome and the moon was almost full. It was a great way to spend the last night! It’s sad to be going home tomorrow. I’m sure we all miss our family and friends and real showers, but Jamaica is definitely a place you can get used to. I’ve had a wonderful experience. I’ve seen things I never thought I’d see (a seahorse! ), and done things I never would have done anywhere else, like climbing up waterfalls and swinging from vines into the water. I’m really going to miss the amazing people I’ve met here, especially the girls of apartment 6, the beautiful, clear waters of Discovery Bay, and two of the most amazing professors I’ve had in my time at Stony Brook. It was an incredible learning and life experience. Well I’m off to pack. See you all in New York! 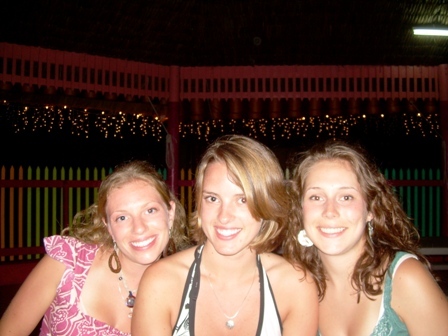 Photo Caption: Ashley, Elyssa, and Marcy (from left to right) enjoy an evening out for dinner at The Ultimate Jerk, a local restaurant. Photo caption: Just like in Long Island waters, flounder can be hard to spot. Luckily, the water here has been 81F degrees the entire time we’ve been here, except when you swim through a groundwater plume, then it’s a downright chilly 75 or so. This morning I woke up around 7:30 just in time to have some breakfast before running some trials for Helen’s and my project. I stepped outside to a gray-tinted, overcast sky as a few welcoming droplets of rain landed on my head. By the time I reached the cafeteria the drops stopped and I walked in to see lil miss red stripe and the hard working Adam. Rachel (red stripe) put it the best when she stated, "I usually prefer to sleep a little later then this, but having this delicious food to wake up to every morning is just so good." Everyone agreed and we continued to drink our coffee and fill up on warm French toast drizzled in maple syrup, the best bacon I’ve ever had, all accompanied with fresh pieces of pineapple and watermelon. Helen stopped in shortly after we began to eat to join us, and the rest began to shuffle in as the morning progressed. Helen and I went to work on our fish and sound project in the wet lab and midway through our project SCUBA Steve came in to let us know about the group dive was going on at 10 am. When Helen and I finished the trial, I debated going out due to the choppy look across the blue ocean that seemed a shade darker then the previous days while covered in white caps that I haven’t seen since the first few miserable weather days we encountered upon our arrival. It cleared up since breakfast quite a bit and the sun was beginning to shine brightly so I gathered my snorkel gear and decided to take it easy and just snorkel along with other Ashley, Andrea, and Rachel. A large portion of us piled into the two boats and headed out to the site, Pear Tree, that was just east of dairy bull, I was really looking forward to seeing some of the large sponges that were sited in an earlier dive by Steve and Chris. Out on the water the waves were still pretty high and we all held on tight while going over against the waves that were nearly breaking on our bow. I don’t know about everyone else, but I sure was looking forward to jumping in those waves. It’s not everyday that you get to play around in waves that size around here where there is no beach. However our dive master, Anthony, turned us around and took us back because the conditions were not adequate for activities such as SCUBA. I do think though that I speak for most by saying the boat ride alone was pretty fun. Helen and I went to work once again on our project doing a trial right before lunch. Once we finished our experimental trials, we washed off and headed back to the cafeteria for some good eatin’. The ladies made us baked potatoes with cheese that when accented with some hot sauce were super delicious!! Of course there was also some salad and fruit for the side. Helen and I went back to work on our projects as did most everyone else, some of us catching some rays of afternoon sun in the process. That’s the great thing about taking class in Jamaica; you can sit outside in JANUARY doing your work!! Later a few of us decided to break away from working and take a stroll along the shoreline to a sandy beach we came across a few days prior. There is nothing like finally finding a place that you really feel secluded, a place you can crunch your toes around in the sand while pondering thoughts of the day. When we all returned it was just about time for dinner, but most of us squeezed in some last efforts with our projects before heading in. Dinner was by far the best meal of the day. We had a scrumptious hot and sour with pineapples, smoked chicken that we could smell a mile away, baked fish with peppers and onions, fried rice, a broccoli casserole with mushrooms, and some tomatoes and cucumbers. As if that wasn’t enough the ladies even made us this incredible cheese cake topped with strawberries. After dinner we all scattered to do some last minute fixes on our power point updates for our projects that were due at 8. By the time we were finished with all the presentations we were all pretty much shot, except from what I remember scuba Steve and Rachel who were going to make herself a fire on the jetty. Andrea, Marcy, Sara, and I decided it was movie night and we started to watch Hot Fuzz for I’d say around twenty minutes. We all dozed in and out of sleep before just shutting it off and calling it a night. The days here seem so long and it’s as though you have nothing but time all the time. It’s a feeling that I find it almost impossible to describe in anyway other then sublime. 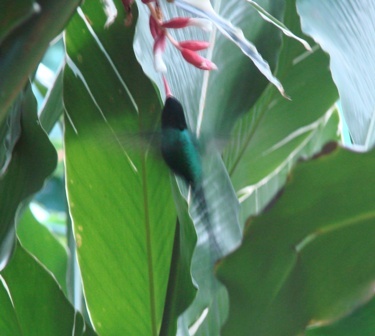 Photo Caption: A hummingbird flaps faster than even a digital camera wielded by Steve can capture. BLOGTASTIC! So this morning arose like any other; waking up to (other) Stephen’s alarm a good 3 times before springing to life and staggering 20 feet to the cafeteria, maybe kicking a cinderblock on my way, maybe not. The food these ladies cook is delectably amazing, and even though breakfast is the worst meal they serve, some fresh pineapple in the morning never fails to satisfy. After fueling up, I suited up to check my problematic research project which, I will spare you the not so excruitiating details of. After this small bit of work it’s all smooth sailing. Relaxing in the sun, joking around, some jumps into the saltiness they call ocean are all part of the experience. It has been days since my feet have felt the hug of socks; my shirts decide they rather be carried and not worn. A nice warm breeze never only complements the feelings of comfort felt. So today’s adventure led us to the beautiful botanic gardens of Cranbrooke. You almost forget how gorgeous Jamaica is when you don’t leave the complex in a few days. So we arrived at this place with peacocks and hens running wild, one albino, and we had a local guide walk us down this trail. This clear cut path wound along a babbling brook of sorts, with splendid horticulture all around us. From clusters of giant bamboo plants, to banana trees, to coconut trees, and even bird of paradise we saw it all. Not to mention hundreds of exotic plants I couldn’t begin to name, let alone recognize. Before long the trail ended, at a spring-like pool that fed into the brook. The walls extended high from the water with vines dangling freely where we could swing, jump in off high rocks, or just swim around. How strange it felt to swim in fresh water, without flippers. That was amazing, and on the wayback we stopped to play Frisbee in a field and we were even privileged to see the national bird, a hummingbird. That was pretty much it, when we returned we had some deliciousness (food) and ended the night out on the jetty with some French reggae music and a friendly fire. Orion above us, the half full moon to the west, water all around, and a light warm breeze we were engulfed by Jamaica’s beauty. So yeah, that was pretty much my day. PS. My ankles itch badly. Jackie is either enjoying some free time by snorkeling around the bay exploring what’s out there or is working on her research project by collecting animals. Given how much time each student spends in the water, it’s tough to know whether they are working or relaxing. My partner and I are studying the effects of captivity of Diodon holancanthus (Balloon fish); particularly studying whether captivity affects the Balloon fish’s ability to respond to a stressor. Our project consists of inducing a stressor (catching the Balloon fish in a net) and observing whether the fish respond by inflating and noting the duration of the inflation. We have been performing these tests every four hours since last Thursday. Thus far we have not seen any correlations or patterns of response of the Balloon fish to stress, but we hope to have more results as we continue our testing until this Thursday. (Hopefully my partner and I will survive until then on 4-hour intervals of sleep!) Unfortunately one of our fish died today (R.I.P. Fish H). After the boat trip to Rio Bueno this morning, there was lunch at 1:00PM. (The food is amazing-breakfast, lunch, and dinner!) After lunch everyone continued to work on their research projects. My partner and I ran stressor tests on our fish at 4:00PM, followed by an evening test at 8:00PM after dinner. Our next scheduled test will be at 12:00AM. 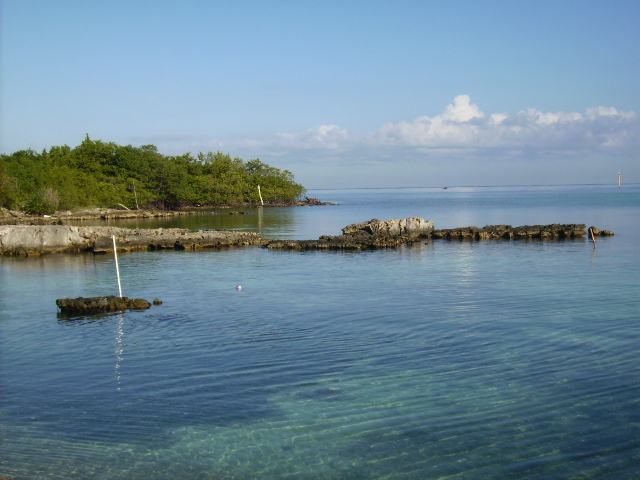 I cannot sum up the experience that I have had thus far simply within this blog, but I will write this: The study abroad in Jamaica MAR 388- Tropical Marine Ecology course has changed my perspective of the world. Not only is this the first time I have ever gone on an airplane and traveled outside of the country, but this course has introduced me to a new world…the Marine world. 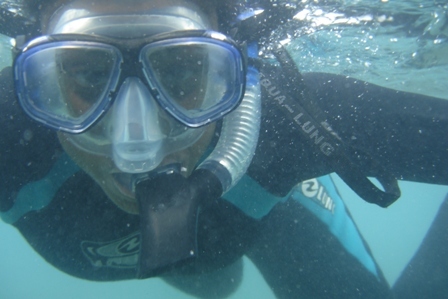 I have learned how to snorkel, learned about, as well as seen, many organisms and fish in the marine ecosystem that I would not have been exposed to had I not ventured to take this course. 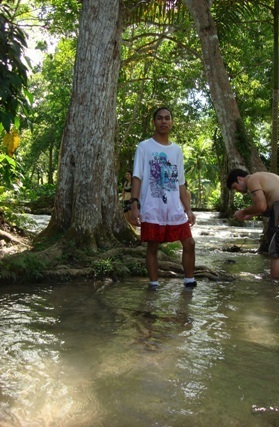 I even climbed all the way up a waterfall at Dunn River Falls! Now I am getting my Open Water Dive Certification so I can enjoy even more trips in the water and appreciate what I have learned through lecture! I am also anticipating the final results of our research project. Tomorrow afternoon, after morning research and lunch our class will be going to a botanical garden, and I can’t wait! All in all, I am enjoying the course and I am enjoying Jamaica. The student’s laboratory here at Discovery Bay Marine Laboratory. Tropical plants and animals can be found right off the dock in shallow water, or you can swim out past the mangroves (on your left) over the reef crest and dive and snorkel in waters about 25′ deep to see a larger variety of life. Another beautiful day in Jamaica. The sun was high and strong, temperature was in the mid 80’s, and the water was clear and warm. Of course there was the 10 minute lunchtime sun shower but I think we’ve all come to expect that at this point. And with all the beautiful sunny weather we’ve been having, we’re all understanding (even more than before) the importance of sunscreen! Last night was the second night of project updates and all the projects are well underway. Just about everyone is diving or snorkeling every day and there are quite a few experiments going on in the wet lab tables. There are damselfish, brittlestars, urchins, and balloonfish, experiments with music, seagrass tethers, and groundwater. All the projects are so varied, covering a wide range of interests and animals, it will be interesting to see all the final results. 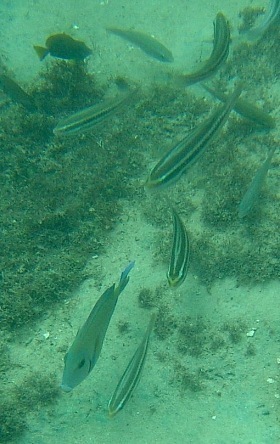 Tomorrow is another day of fun diving in the fore reef, either at Pear tree or (insert Brad’s accent here) Rio Bueno. No matter what site, the dives are always fun and exciting, with all sorts of fascinating creatures to see. Hopefully there will be another sea turtle or with any luck, a spotted eagle ray. And of course we’re all excited about the trip off the compound to the Cranbook botanical gardens on Tuesday. Five more days in beautiful Jamaica…. Sal and Chris stand at the top of Dunn River Falls. Sal’s shoes have almost fully dried out now from the hike up the waterfall. I woke up at about 8:30 am and went to get breakfast. It was a basic breakfast this time compared to their great breakfast food other times. It consisted of French toast, bacon and fruit such as papaya and watermelon, it was delicious and filling. After that I just walked around the compound for a bit just taking in the fresh air and the beautiful scenery. From 10am to about 1:30pm I stayed in my room, relaxed and took a nap which I shouldn’t have because I missed lunch. My lunch consisted of Oreos, milk and Ovaltine biscuits. You would think now with the other groups gone that there would be more food to go around but I guess people are just hungry fiends. After lunch I resumed my science research project which is on Green Sea Urchins (Lytechinus variegatus) being able to survive in a brackish environment with natural food like Turtle Grass(Thalassia testudium) and/or artificial food like Yellow Corn Meal. I weighed the food first and then feed the sea urchins their food. Group#1 received only macro algae from the saltwater pipes, group#2 received only turtle grass, group#3 received only yellow corn meal, and group#4 received yellow corn meal and turtle grass. The basis of the experiment is which ever group of sea urchins die first means that they cannot survive in that particular type of environment with that specific food. Everyday I will also lower the salinity gradually with freshwater till it reaches about 20 ppt on the last day. I am looking forward to see how low the salinity can be for these sea urchins to live in. After my project I went back to my room to listen to some music, one of the artists being Bob Marley, one of my favorite artists and why not? We’re in Jamaica Mon. For Dinner we had small pieces of soft supple steak drenched in gravy, a sauce coated fish, cabbage, spinach and other vegetables, a salad with lettuce, cucumbers and tomatoes, and for dessert gingerbread cake. The food was amazing and delicious like everyday. I don’t even stuff myself like this during the semester or at home even though my mom makes awesome food. After dinner mostly everyone gathered at the girl’s room to chill, have fun and play cards. 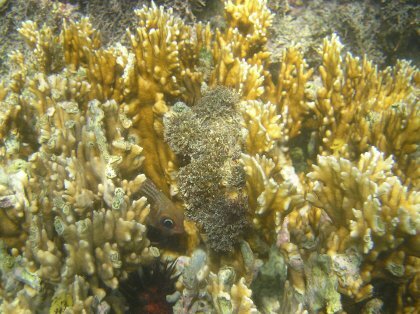 A squirrelfish lurks amongst a stand of fire coral. It doesn’t seem to bother the fish but we try to avoid bumping into the stuff. Greetings from Jamaica! It’s difficult to believe that it has already been over a week that we’ve been here in Discovery Bay, and that we only have about a week left. Today the wonderful ladies in the kitchen prepared all-American meals for us, reminding of the food at home. For breakfast, we had eggs with cheese, toast and maybe a cup of coffee to get our bodies up and running. Lunch consisted of little mini pizzas, chicken nuggets, and lasagna. For dinner, we had potatoes, carrots, beans, chicken, and some delicious red meat. The best part was desert, fudge brownies with walnuts. So, in other words to those at home, we are well-fed here. Some of us started off the day with a 6 AM open water dive session, which meant getting up at 5 in the morning. All of us went out and started working on our research projects, some of us making more progress than others. At 2 o’clock, 7 of us went out for our final open water dives and are now certified divers! Congratulations to everyone! From now on we don’t have to linger behind and watch in envy as Brad and Joe brag about the two sea turtles that they saw swimming around on their dive trips. Just kidding. In short, we are enjoying the lovely weather that has finally made it seem more like we were in Jamaica. Now we must go and hunt some more Damselfish, balloon fish, brittle stars, and sea urchins for our projects. Busy, busy! Ashley N. begins the snorkeling trip to the front (ocean) side of the reef at Discovery Bay. Everyone was able to sneak over the reef top despite there only being about 18" of water depth. Today was an awesome as usual day down here. We all had to get our research project proposals done by lunchtime, so Rachel, Elyssa and I (my two partners in crime for this project) went out after lunch to see what we could see regarding the various coral diseases out in Discovery Bay. We want to do a project about the abundance of the various diseases, looking at the percentage of healthy corals versus sick corals and the correlation between the species of coral versus the type of disease. On a tip from one of the Canadians, we snorkeled all the way out towards the weather buoy by the reef crest and saw more than enough diseased corals to make our project viable. The plan is to mark off 10m by 10m plots and run transects through them as a way to systematically count the amount of diseased corals in each area. I’m pretty excited to start the project tomorrow, as is everyone else I am sure. After lunch, Brad and Joe took a bunch of us on a snorkel out and over the reef crest. Although it was a little tough getting over the crest with the waves and shallow conditions (and abundant long-spined urchins), the reefs on the other side were really cool and very different from the back reef. This was my first time seeing sea fans and bigger corals, and although the usual fishy suspects were there too (like doctorfish and french grunts) there were definitely lots of new fish for me, like a black triggerfish, bright blue chromis and these beautiful blue-spotted damselfish. The most exciting part of the snorkel, however, happened literally 5 minutes before we got back into shore: Rachel found an octopus! I heard her scream (with excitement of course) and turned around to see her staring down a rather sizable octopus. It kept slinking into crevices, but every once in awhile it would just come out and stare back at us, like it was sizing us up or something, it was so cool. We followed him through the crevices for a while and once it figured this out, it moved out into the open, changed colors and tried to pretend to be a rock. Once it figured out that we knew it was still there, it darted into the nearest crevice for good and we gave up the chase. Its pretty ironic that we found this guy out in the open in the daytime when a couple of us had spent an entire night-snorkeling trip looking for octopi the other night. Rachel and I were all excited as we swam back in to tell everyone of our cephalopod friend and were both surprised to then see a little barracuda hanging out in the grass, another species we both had yet to see until today. All in all it was an awesome trip, followed by a bit of napping in the sun and another great dinner here. Hope its not too cold back in New York! 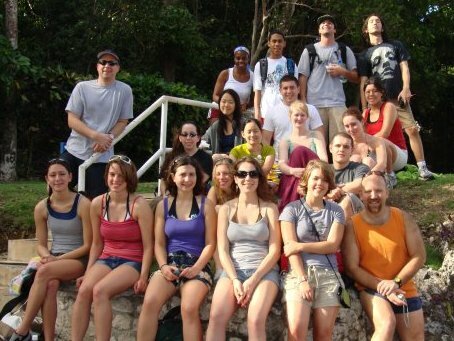 Everybody was up bright and early in the morning to head to Dunn River Falls. This is our entire group, except Adam who was running towards the group as the photo was shot. Today we left Discovery Bay and ventured out into the gorgeous countryside of Jamaica. Our first stop was Dunn River Falls. Although we were apprehensive about the massive amounts of tourists, we entered the park and started our descent to the beach. The water was beautiful and crystal clear. There were guides all over the place trying to organize the myriad of people. Thanks to our fearless leaders, we managed to escape the grasp of the guides and start our ascent up the huge waterfalls. Although exceptionally slippery, we all seemed to being handling the climb well. For most of us, the problems we encountered climbing were due to the conga lines of people being lead up the mountainside. The falls were amazing and the water was on the cooler side but it was very refreshing. Some of us lost some sunglasses and various other things we took with us. We were warned against taking these things but like most college students we didn’t listen to the simplest of instructions. All in all the falls were beautiful and everyone enjoyed themselves. After we finished the climb about half the group stayed behind to play in the small pools at the top of the falls. By far, I believe this was the best time we had as a group on the trip. After we all dried off and changed, we got back into our vans and went to Ocho Rios, a town that is a tourist destination of all the major cruise ships. Our bus driver, Pablo, took us on a detour to show us an amazing view of the town from above. We took some wonderful pictures and stared in awe at the massiveness of the cruise ship that had pulled into the harbor. Once we got into the town we found out we had a little over two hours to find food and do ALL of the souvenir shopping we promised our families we would do. Some of us went to Margarittaville while others hauled ourselves over to the local Burger King and enjoyed some Whoppers. I think most of us haggled ourselves silly in the flea market buying shot glasses, decks of cards, and many other things I will not give away but it’s safe to say you will enjoy your presents when we return. It took a little while for us to get rounded up for our ride back the Discovery Bay but we all got back in one piece and had another delicious dinner made by the fine ladies our kitchen. Many thanks to those women and all of the people that helped us have a wonderful day. The day began cloudy and windy, but by 11 am, the clouds had cleared, and we were graced with fabulous sunshine for most of the day, with trace amounts of precipitation occurring intermittently throughout the day. Rachel, Ashley, and I went out for an evening snorkel, and on the way back, a beautiful and full rainbow appeared in the sky, and rain began to fall. While underwater, we could feel and see the rain coming down, and it was really quite an amazing thing. Wish us luck on our test! Today was yet another splendid day in Jamaica, complete with unpredictable weather, goat for supper, and a test review session. Unlike the previous days, today held a much looser schedule, allowing us ample time to work on our photo libraries and study for our upcoming exam. As most of our days have, today began at 8am with breakfast (this time it was pancakes and fresh fruit). Following the feast, Joe and Brad gave us the day to work on our photo libraries that are to include algae/plants, fish, and invertebrates found around the reef at Discovery Bay Marine Laboratory. Working in pairs, we have been photographing and gathering a variety of organisms, storing some in the wet lab at Discovery Bay; after taking the photos, we’ve identified the plants, algae, and inverts down to genus and species. 1.) The sargassum fish [True story: Thinking this was a leaf floating at the surface of the ocean, I snagged this fish with my bare hands, soon realizing the leaf was actually a fish. A victorious moment for me! ], 2.) The banded arm brittle star (Ophioderma opressum) [Don’t be fooled by their fragile appearance—these guys can book it! And they’re not afraid to break a leg… really…], 3.) The Spotted seahare (Aplysia dactylomela) [Their oddly soft texture coupled with their spotty appearance makes this fellow from Phylum Molluska loveable to all], 4.) Green grape algae (Caulerpa racemosa) [The common name couldn’t be more accurate. This algae is way cute, so it makes the cut], and last but not least, 5.) Fireworm (Hermodice caranculata). Tomorrow, everyone will present our findings and identifications in Powerpoint presentations. Tomorrow also brings our first (and last) exam for the course! Joe and Brad were generous enough to host a review session, and we’ve been doing nothing but studying for it (in between snorkeling and sunning in the beautiful Jamaican sun) all day and night long.